Roger Daltrey and Pete Townshend will perform the closing set at Glastonbury 2015 with Paul Weller as their warm-up act no less. 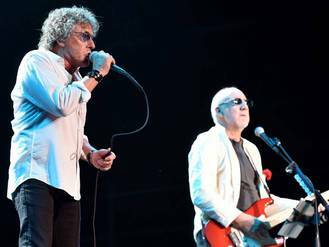 The final remaining members of The Who were announced as the festivals final headliners after huge speculation – and the news confirms Michael Eavis’ remarks a week ago that the Sunday night acts would be two British artists. Their last appearance at the Somerset festival was in the same slot in 2007 when they were promoting The Endless Wire, their last studio album prior to their 50th anniversary compilation The Who Hits 50 which came out last year. Weller also appeared on the Pyramid stage in 2007 although he performed on Saturday night rather than before The Who on Sunday. Last year Leicester rock band Kasabian performed the often career-defining Sunday night Pyramid stage set. This year’s festival will be taking place between 24 – 28 June at Worthy Farm near Pilton with Pharrell Williams, Florence and the Machine and Patti Smith among the lineup. As usual the festival will provide its audience with an eclectic mix of artists, with RnB singer Mary J Blige and hard rock pioneers Motörhead both making their first appearances at the Somerset dairy farm. Motown singer Lionel Richie and jazz singer Gregory Porter, Nineties favourites Suede, The Vaccines, The Maccabees and Alt-J are also set to perform. Stephen Hawking and Dynamo confirmed to appear at Glastonbury 2015. Jennifer Lopez bids farewell to American Idol and hello to Las Vegas residency. Noel Gallagher has been accused of plotting his solo career before Oasis split up. Taylor Swift has been spotted cheering on her rumoured boyfriend Calvin Harris at one of his gigs. One Direction give James Corden first post-Zayn Malik TV interview. Rihanna banned Rita Ora from her Met Gala after-party. Pharrell Williams and Robin Thicke’s 'Blurred Lines' copyright saga continues after lawyers for the pair demanded a new trial. Chris Brown is alleged to have attacked a man during a basketball game in Las Vegas.